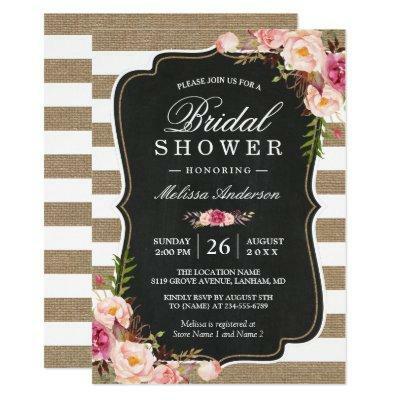 ================= ABOUT THIS DESIGN ================= Modern Rustic Country Floral Burlap Stripes Bridal Shower Invitation. (1) You are able to change the Black stripes to Any Color by clicking the "Customize it" button and then setting the background color. All text style, colors, sizes can also be modified to fit your needs. (2) If you prefer a thicker paper, you may consider to choose the Matte Paper Type. (3) If you need any customization or matching items, please contact me.